The City is undertaking and evaluating amendments to the West Springs Area Structure Plan (ASP), as a result of applications to develop portions of the West Springs area. On November 24, 2016 Council directed Administration to undertake and evaluate an amendment to the West Springs Area Structure Plan (ASP), through the developer funded ASP Program. The developer funded ASP amendment focused on approximately 34 hectares of land and is being reviewed concurrently with two applications, West District and West Park. There are two additional development applications that lie outside the developer funded ASP boundary, but also propose development in the West Springs area. The proposed amendments can now be reviewed in the draft West Springs ASP. The amendments were presented to Council on February 20, 2018 and were approved. The final policy will be available for review shortly. West District: Approximately 22 hectares of land is being reviewed as an Outline Plan and Land Use Amendment application. West District is a proposal for a master planned neighbourhood in west Calgary that proposes a compact, higher-intensity (people and jobs), transit-supportive and mixed-use neighbourhood. 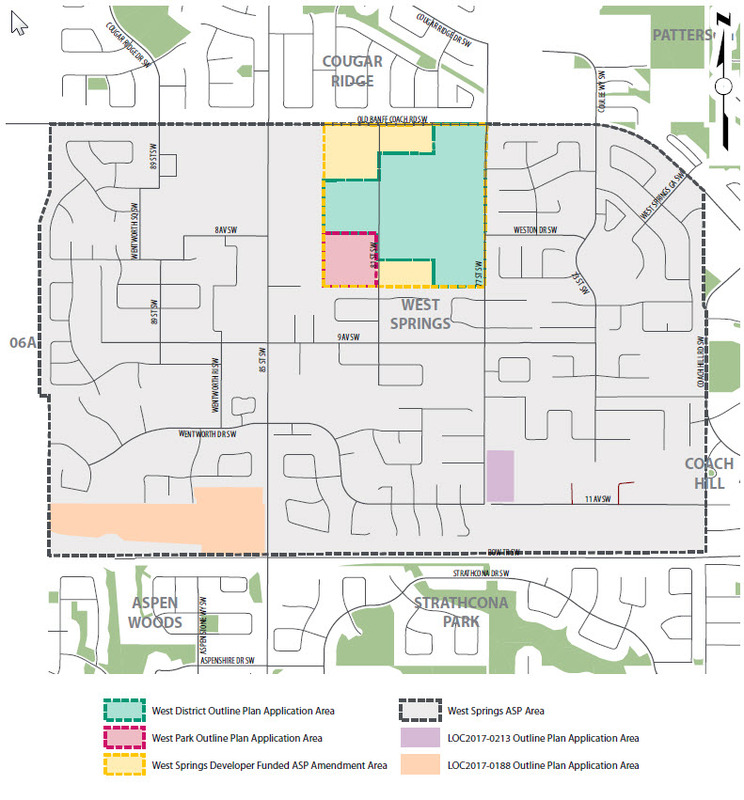 Located within the community of West Springs, the West District plan area is south of Old Banff Coach Road S.W., east of 85 Street S.W., west of 77 Street S.W., and north of 9 Avenue S.W. The Outline Plan for West District was approved by Calgary Planning Commission on December 14, 2017. The Land Use Amendment application is scheduled to be presented to City Council on March 19, 2018. Since the Land Use application has to be approved by City Council, the final decision on the application will not be made until City Council decides on the Land Use. West Park: Approximately 4 hectares of land is being reviewed as an Outline Plan and Land Use Amendment application to plan and develop a portion of West Springs, to be called West Park. West Park includes the area north of 9 Avenue S.W., between 77 Street and 85 Street S.W. (including the parcels of land located at 819 81 Street S.W. and 839 81 Street S.W.) The proposal is for residential development. The Outline Plan for West Park was approved by Calgary Planning Commission on December 14, 2017. The Land Use Amendment application is scheduled to be presented to City Council on March 19, 2018. Since the Land Use application has to be approved by City Council, the final decision on the application will not be made until City Council decides on the Land Use. LOC2017-0213 Site: This application on 1.9 hectares of land at the corner of 11 Avenue S.W. and 77 Street S.W. proposes an anticipated 30 single detached homes and an open space. The application was presented to Calgary Planning Commission on January 25, 2018 and recommended for approval. It will be presented to Council on March 12. LOC2017-0188 Site: Approximately 13 hectares of land is being reviewed as an Outline Plan and Land Use Amendment application to accommodate low density and multi-residential units, as well as commercial uses and a green space. The plan area is located to the west of 85 Street S.W. and north of Bow Trail S.W. Additional engagement opportunities will be available in 2018. Please note: At this time, the southeast area of West Springs amendment is on hold for further technical review and will not be proceeding to Calgary Planning Commission and Council. For a summary of what we heard during Phase 1 and Phase 2 of public engagement, review the What We Heard reports located under the links section in the right column above. Citizen feedback provides Administration and City Council with valuable, local knowledge of the community and the proposed development area. The citizen input provided through our engagement program has helped to inform Administration’s review of the application and amendments. Administration has shared all of the engagement results with the applicant, and has used the feedback to inform the final recommendation on the West Springs ASP amendments. City Council approved the West Springs ASP amendments during the February 20, 2018 Public Hearing of Council. Council provides new direction on how the city will grow and move with the Municipal Development Plan (MDP) and Calgary Transportation Plan (CTP) approval. Application submitted for an Outline Plan/Land Use Amendment to accommodate a vision for West Park, requiring an amendment to the West Springs ASP. City Council approves using the Developer-Funded Area Structure Plan model for the West District plan area amendment. Application submitted for an Outline Plan/Land Use Amendment to accommodate a vision for West District. Online and in-person public engagement about West Springs ASP amendments. Proposed West Springs ASP available for review. Final public information session held. West Springs ASP amendments to be presented to Calgary Planning Commission (CPC). West Springs ASP amendments approved by City Council.